With elections underway or imminent in Ivory Coast, Niger, Tanzania and Guinea, Africa seems to be entering a season of democracy. But it follows a year that saw democratic governments and processes take a hit across the continent. Meanwhile, U.N. peacekeepers have struggled to contain violence in eastern Congo, tensions are rising in Sudan in anticipation of January's referendum on Southern Sudan's independence, and power-sharing agreements are being tested in Kenya and Zimbabwe. Hovering in the background, the continent's regional power, South Africa, struggles to realize the promise of its post-apartheid potential. 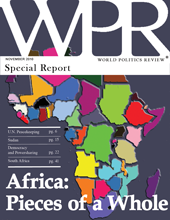 World Politics Review offers a closer look at the pieces that make up the African whole with this collection of recently published articles. Sudan's Elections: Historic, but Futile? Kenya: Rounding the Corner back to Democracy?